FREE SHIPPING ON ALL ORDERS OVER $100 IN THE CONTINENTAL U.S.
Bad Water May Look, Taste, or Smell Like Good Water! Often contaminants leave behind a trace detectable by your senses, but not always. 1. Get your water quality tested in a lab! A basic mineral analysis will show the most common issues, such as iron, manganese, dissolved solids, tannins, pH, and hardness. EPA certified lab tests will cover water safety issues. 2. To do a basic mineral test of your water, let your faucet run for a full two minutes before taking your sample. This way, the water is more likely to be the most representative of the water you use on a daily basis. Sample bottles can be provided from a water testing service company, like Clean Water Systems & Stores. 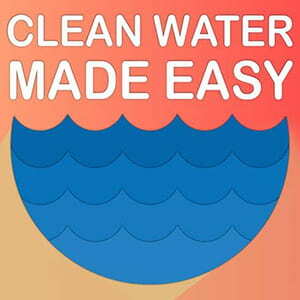 Clean Water Store will also test a sample taken using your own empty water bottle. 2.5. If you are using your own water bottle, fill and empty the bottle to rinse the inside. Do this twice before sampling. Rinsing the inside walls of the bottle reduces the possibility of contamination from other water that may have previously been inside. 3. Fill the bottle completely to the brim with as little air space in the bottle as possible. Air trapped inside the bottle may react with the water to change the chemistry of the water sample. 4. Send it in! At Clean Water Store, we will do a mineral analysis for free. Our address is at the bottom of this webpage. For more detailed tips on how to reduce water sample contamination or for procedures to test for bacteria, follow the link to our Well Water Test Kits blog. Get The Latest Well Water Reports by Email. FREE! Home Water Tests That You Can Do Yourself, For Free. Podcast Q&A 11: Why Use a Static Mixer for Chlorination Systems? Free weekly well water tips to make your life easier and save $$$. Get a Fast Answer to your water treatment problems, click here! Looking for information design or recommendations or need assistance? Copyright © 2019 Clean Water Systems and Stores Inc.